Congratulations to Beamdog. I’m pretty sure that Baldur’s Gate: Siege of Dragonspear now holds the record for “Longest Time Between Base Game and Expansion,” at seventeen years. Described somewhat tongue-in-cheek as Baldur’s Gate 1.5, Siege of Dragonspear sees Beamdog move from a curatorial role (Baldur’s Gate: Enhanced Edition) into a more authorial role in the fabled RPG series, creating a thirty-hour expansion that pretty much doubles the length of the original game. But can you really go back to 1998? I spent the last two weeks finding out. I mean, I really went for it. Having not played the classic Baldur’s Gate in a while I started a party from scratch and played through the entire game—and all of the original Tales of the Sword Coast expansion—before starting Siege of Dragonspear. For the sake of this review I’m going to assume you have some level of knowledge of Baldur’s Gate. If not, well, you should probably go play that first. Though generally not held in the same esteem as its sequel Baldur’s Gate II, the two are sort of a package deal of legendary isometric CRPGs. And they can be hard as hell to get into, admittedly. RPG rulesets have come a long way from second-edition AD&D, with its awkward THAC0 (“To Hit Armor Class 0”) combat and a health system that encouraged abuse of the rest mechanics after every combat encounter. Much of Baldur’s Gate spiritual successor Pillars of Eternity—itself one of the best PC games of 2015—was seemingly designed as a direct response to problems with the old Infinity Engine games. I did it though. I fled Candlekeep. I assembled my Good-aligned party (Minsc, Neera, Branwen, Imoen, Kivan, and myself). I sent Dynaheir on a solo journey into a pack of wolves as per usual. I uncovered the source of the iron crisis and (seventeen-year-old spoilers) slew Sarevok. Roll credits. Your Baldur’s Gate party doesn’t last long though. Remember—this expansion is meant to bridge the gap between the original game and the sequel, seeing as the first ends with your triumph over Sarevok and the second opens with you in a dungeon. “What in Bhaal’s name happened in between?” is a question that’s plagued the series for nigh-on twenty years. Siege of Dragonspear begins with you hunting down the last of Sarevok’s old associates, and it’s sort of a farewell tour. Throughout the mission your party members (all, or at least most, voiced by their original actors from seventeen years ago) drop lines about “being ready to go home.” And thus it comes to pass that after slaying Sarevok’s last lieutenants everyone goes their separate ways. Typical. Though they were all nice enough to drop their gear into a bottomless chest in your bedroom before taking off. And wouldn’t you know it: A few weeks later an even bigger threat arises. 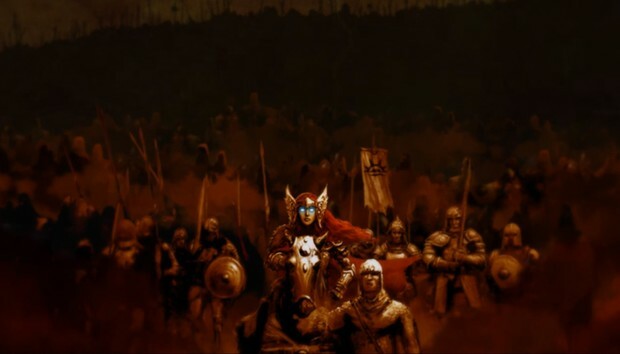 A certain “Caelar Argent,” also known as the Shining Lady, has gathered an army and plans to march on Dragonspear Castle. Also, she tries to kill you. Time to get the band back together, I guess. Or as much of the band as you can, at least. Remember: This takes place between Baldur’s Gate and its sequel. That means at least one companion—Imoen—is too busy dual-classing into a mage to come along for the journey. Some companions (Neera in particular) aren’t available until midway through the expansion. Also when she shows up she’s managed to forget every spell you ever taught her and lose all her equipment. Other companions are simply missing. Both Branwen (my go-to cleric) and Kivan (unstoppable archer madman) absconded so fast that it’s apparently impossible for them to help you save the Sword Coast a second time. Oh, and Dynaheir has somehow resurrected herself and will once again join your party alongside Minsc. Once again, I sent her on a lonesome journey into a pack of wolves. Dire wolves, this time. Though that did make a minor Dynaheir-specific sidequest unfinishable later in the game. But aside from my quibbles about being stuck with less-than-desirable party members as fill-in slots (Glint as cleric and Safana as thief), Siege of Dragonspear feels like...well, like it was built in 1998. And I mean that as a compliment. The expansion’s a bit different from the original games in that it’s sort-of linear. You don’t just go where you want, when you want. Instead the expansion takes the form of “an army on the march.” You begin in the city of Baldur’s Gate, then there are two intermediary regions, and then you eventually make it to the area around Dragonspear Castle. Each of these regions is fairly sizable and freeform, with a handful of distinct areas to travel between and at least one dungeon per section. But once you leave a region, that’s it. You can’t go back. Any quests you left unfinished are unfinished forever. Don’t think you can defeat an encounter at the moment? Tough, because this is your only shot, and some of those early quests have a tertiary effect on the actual “siege” part of Siege of Dragonspear. It’s a different approach, but it works pretty well thematically with the idea of hunting Caelar Argent’s army. And you’re rewarded for exploring. Having replayed Baldur’s Gate, there’s a stark difference in density between the original game and Siege of Dragonspear. There’s a lot of empty space in the old maps, areas with maybe one important building (the Temple map) or person. Siege of Dragonspear has fewer maps but they feel better designed, more colorful, more lively. This isn’t a rarity in Siege of Dragonspear. There are at least two major battles in the expansion, each encompassing groups of maybe thirty NPCs per side. It’s hectic, to the point where there’s a new graphics toggle to highlight your own characters and make them stand out from the fray a bit better. And there are actual crowd scenes. And dozens of in-engine cutscenes. It’s a level of polish and spectacle that, as I said, simply wasn’t possible when the original game was built—but since it’s built out using the same engine and assets, it blends (mostly) seamlessly with Baldur’s Gate proper. If anything, it’s one of those “Siege of Dragonspear looks like you remember the original game looking” scenarios. Oh, and in regards to the larger encounters: They can be hard as hell, at least if you’re playing on the original “Core Rules” setting. Way more difficult than normal encounters in Baldur’s Gate. And again, I say that having literally just played through the entirety of both back-to-back. You can duck the difficulty though, and those who just want to see what Baldur’s Gate is all about now have access to “Story Mode,” which maxes out all your stats and turns off permadeath. Then you don’t even need to worry about THAC0. Other hacked-in improvements include the Bag of Holding, Potion Bags, and Ammo Belts to make inventory management a bit easier. And in case you couldn’t tell from the screenshots: The entire UI received a facelift. New journey, old friends. I don’t know what possessed Beamdog to make Siege of Dragonspear an expansion to the original game, nor do I know what devil’s pact coerced them into making it thirty-odd hours long. It’s insanity. But hopefully this isn’t Beamdog’s last bit of Baldur’s Gate content, because they’ve done an incredible job. As someone who first received Baldur’s Gate for Christmas way back in 1998 on six—six!—CD-ROMs, Siege of Dragonspear feels like a long-lost (and polished-up) chapter of the original, like it belonged from the start. That’s quite a feat, given the seventeen year spread in between. Will it please every purist? Of course not. As with any beloved series, passions run high and nostalgia’s a hell of a drug. There are bound to be those who wish Beamdog had stuck to a purely conservationist role. But Siege of Dragonspear won me over, and I’d like to see what the team does next. Go for the eyes, Boo. NOTE: I did encounter one major bug during the game. My character was teleported into an area for a single scene and then couldn’t get back out again. Luckily Baldur’s Gate is an old game and the cheats are well-documented, so I was able to manually teleport back out and continue playing. But I’ve raised the issue with Beamdog to see if they’re aware, and we’ll be holding our score until we receive a response.